Irvine High School student Nilay Mehta knew that he wanted to work with prosthetics when he started his science fair project. When he began researching the field, he was struck by how costly prosthetic limbs are, so he set out to create a high-functioning limb for as little cost as possible. Using a combination of motors and 3D printed parts, he was able to create a robotic, voice-operated arm for a cost of about $260. Many high-end prosthetic arms can cost upwards of $35,000. Cheaper options are available, but with lower cost comes lower quality. Some have little function other than opening and closing the hand. Using a combination of voice control and electromyography, Mehta’s prosthetic hand can grasp, pinch, point, and perform other precise tasks the way a real hand would. It also comes a step closer to simulating the way a natural limb is controlled. Rather than the brain sending a command to the arm to move, the user speaks a command into a small microphone attached to the arm. “You can say ‘spoon’ and the hand will make a shape that will be able to hold a spoon,” Mehta said. Another factor the 17-year-old considered was upgradability. Children with prosthetics face a challenge that adult amputees do not. Prosthetics can be outgrown just as clothing can, and, as Mehta pointed out, many children need to change their prosthetics every six to eight months. 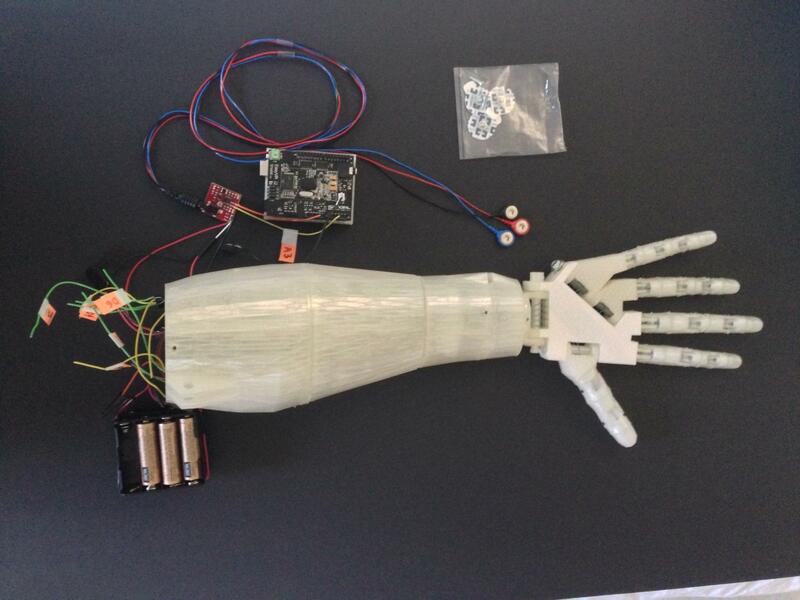 By using inexpensive 3D printed parts, the robotic arm can be resized for a minimal cost. In February of this year, Mehta entered his robotic arm into the Irvine Public School District science fair, where he won first place. He then went on to win four first-place awards in the Orange County Science and Engineering Fair, and was subsequently chosen to enter the 2015 Intel International Science and Engineering Fair in May. There, his project took third place in the biomedical and health sciences category. He also took a third place award in the California State Science Fair; you can see his project abstract here. Now that the prototype has shown so much potential, Mehta plans to develop his robotic arm further and enter more science fairs. Ultimately, he hopes that his invention can one day enter the prosthetic marketplace and further simplify the lives of amputees. He has certainly made a promising start. Through the initiative and intelligence of Mehta and other young people like him, the lives of amputees can only improve. Let us know your thoughts on his design in the High School Student Designs 3D Printed Prosthetic forum thread over at 3DPB.com.